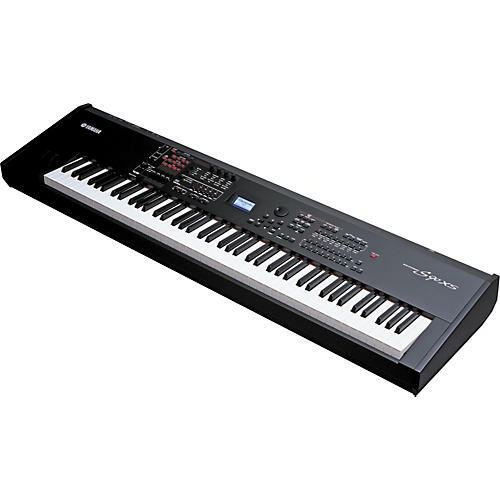 The Yamaha S90 XS Music Synthesizer is an exceptional keyboard for performing and creating. It's a realistic, naturally expressive synth with a true piano sound. Its highlights include convenient, realtime controls for adjusting the sound as you play, the ability to record audio to USB memory, extensive computer music features, ease of use, and compact size and portability. The Yamaha S90 XS is designed specifically for players who want high-quality piano sounds and expressions; casual players and hobby musicians will appreciate the synthesizer's exquisite sounds, advanced features, and superb playability just as much as professional artists. The S Series features all the voices, performances, arpeggios, and virtual circuit modeling effects found on Yamaha's flagship Motif XS Music Production Synthesizer. The S90 XS adds a huge 142 megabytes dedicated exclusively to high-quality piano waveforms, for a total of 456 megabytes of instrument samples. Foremost among these piano sounds are the samples taken from Yamaha's world-renowned S6 concert grand piano. This synthesizer fully captures the richly textured sound of the wonderfully expressive S6, and provides a warm, concert grand piano sound. In the past, conventional keyboards had sounds designed primarily for the listener. The S90 XS, however, was designed to satisfy the player. Yamaha reasoned that when a performer hears and experiences the best possible sound, their performance would be the best possible too. The result is the S90 XS, a genuine musician's instrument that truly inspires the live performer as well as the music creator and arranger. The S90 XS electronic keyboard lets you quickly and conveniently create your own custom performances with the amazingly fast and easy Performance Creator feature. Select a voice, then quickly program layers and splits-even assign a drum voice complete with arpeggios to create your perfect performance. Let's say that you're playing a piano voice and you want to layer a string sound on top of it. Simply press the layer button, then select the desired voice category and voice, and store your new performance with the press of a button. The panel controls of the Yamaha S90 XS have been designed and positioned for optimum, intuitive operation, especially for live performances. For example, with the top-panel controls you can quickly select a part, turn it on and off, set arpeggios and turn them on and off, and switch on arpeggio hold, in addition to instantly tweaking important synthesizer parameters using the knobs and sliders. and you're set. You can also use the control knobs to finely adjust the volume and directly apply reverb or chorus to the sound. If you've got a USB memory device or thumb drive, you can plug it into the S90 XS and record your performance as audio data. This remarkable feature lets you instantly capture what you play on the keyboard (including arpeggio playback) to your USB device. If you've connected a microphone or guitar, you can record your singing or playing as well. You can also record audio directly to the internal flash memory (192 megabytes) built into the instrument without the need of a memory device. Keep in mind that anything you've recorded to the memory device (even audio files created on your computer) can be played back on the Yamaha S90 XS, which means you can create your own custom audio backing tracks and perform along with them. For example, you can create a basic song track beforehand, then sing and solo over it during your performance or add guitar parts and vocal harmonies to be played back during your live performance. There's also a useful song chain function that lets you string together separate recordings and create a convenient backing track "set list" for your gigs. The S90 XS has balanced hammer-effect on its 88 keys for those players who need a full-range, full-scale keyboard. It's exceptionally portable and absolutely perfect for live performers and gigging musicians. The Yamaha S90 XS is also a perfect companion for your computer music production system, serving both as a master keyboard and a full-function, multitimbral tone generator. With the Digital Audio Workstation (DAW) remote function and its 50 different control templates, you get amazingly easy, intuitive control over your main DAW software and Virtual Studio Technology (VST) instruments directly from the panel controls. Moreover, the Voice Editor and Remote Editor software gives you convenient, comprehensive computer control over all the sounds, settings, and functions of the S90 XS keyboard synth.